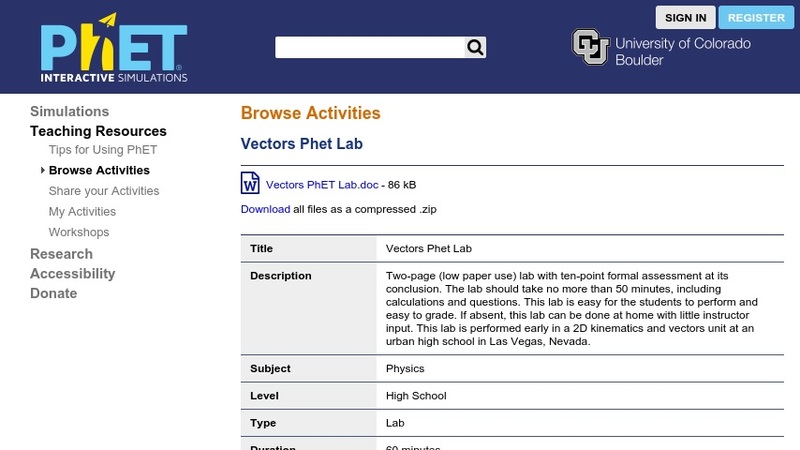 This virtual lab was developed by a high school teacher specifically for use with the PhET simulation "Motion in 2D". It provides explicit direction for using the simulation to explore vector quantities, vector addition, and calculating resultants. In the last half of the activity, students demonstrate understanding by performing specific calculations, then using the simulation to check their work. The lesson includes printable student data tables. The associated simulation (which must be running to complete this activity) is available from PhET at: Motion in 2D. Editor's Note: This lesson provides guided instruction to help students stay on task as they explore vector quantities with the simulation. It then takes the learner to the next level: can they apply what they learned to perform the calculations to find vector resultants?